Living cells inside a tissue can pull on their environment. LMU biophysicists demonstrated that this cellular pulling dramatically enhances the stiffness of the surrounding matrix. Inside living organisms, cells naturally grow within the extracellular matrix, a 3D network of biopolymers. The mechanics of this matrix can strongly influence the behavior of living cells, an effect called mechanosensitivity. This mechanosensitivity can impact various cellular processes, including gene expression, cell migration and stem-cell differentiation. Professor Chase Broedersz, biophysicist at LMU and at the Nanosystems Initiative Munich (NIM), and colleagues at Cambridge (USA), Paris and Princeton discovered that mechanical interactions between cells and the matrix go two ways: cells not only feel the stiffness of their surroundings, they also dramatically modify it. Cells adhere to the matrix and pull on, creating a tension in the surrounding matrix that increases its stiffness by a hundredfold. This is the first direct evidence that cells can use a mechanical contraction to modify the stiffness of their surrounding 3D tissue in such a dramatic way. “When we walk across a bridge, this don’t affect the mechanical properties of this structure. Our study show that things are different for cells in tissues. As cells move through the matrix, they can pull on the structure to strongly enhance its stiffness”, explains Broedersz. This increase of matrix stiffness is made possible because the stiffness of biopolymer matrices is highly nonlinear: the matrix stiffens when it deforms, unlike most regular non-biological materials. Broedersz and coworkers exploited this nonlinearity to develop a new method to characterize cell-matrix interactions. Their so-called Nonlinear Stress Inference Microscopy (NSIM) makes it possible to infer mechanical stresses induced by the cell in 3D. 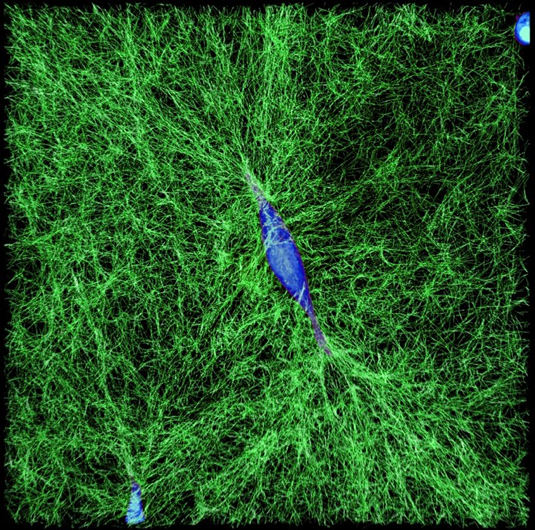 By measuring these stresses with NSIM, they could understand how cells interact mechanically with their surrounding extracellular matrix. This study, published in PNAS highlights the importance of cellular stresses and matrix mechanics at the microscopic scale, and suggests a concrete mechanism through which cells can control their microenvironment and mechanically communicate with each other.